This historic jail plays a significant role in Murder in Coweta County, the bestselling book by the late Margaret Ann Barnes, which was later made into a movie starring Johnny Cash and Andy Griffith. Based on the 1948 murder of Wilson Turner, who was jailed here by a corrupt sheriff, then let go to be killed just over the county line near Moreland (Coweta County) by John Wallace, a bootlegger who controlled the sheriff and most of Meriwether County at the time. Wallace was eventually convicted. The case was significant in that it was the first time a white man had been convicted of murder on the testimony of African-Americans in Georgia. They had been witnesses to the original crime. As a teenager, I was lucky to have met Ms. Barnes, who recalled the impression this jail and its dark history had on her ongoing quest for “Southern justice” through her writing. 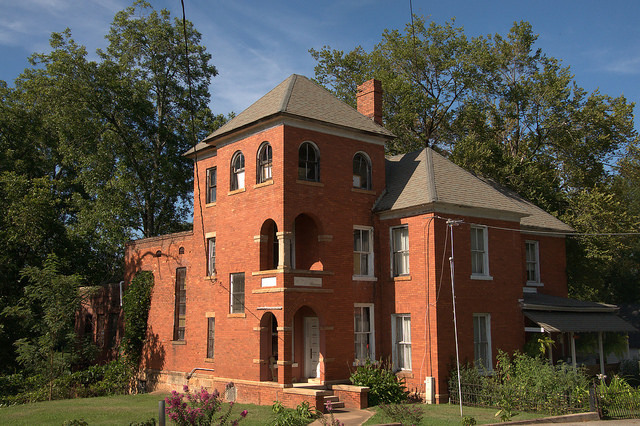 The jail is now a private residence.